Remember I was explaining last week my dismay for ripping out the tile on the FLOOR in the upstairs guest bath??? Hey, I figured the dust this project was kicking up was already making me cranky...I might as well get er' done in one fell swoop. 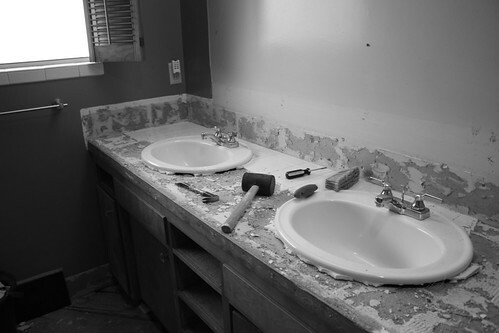 So, with a sledge hammer I continued to knock out the tiled counter: remove the sinks, remove the counter top in one piece and demo'd out the vanity which was the only thing I couldn't manage to do on my own- man that baby was wedged in there! Nope.Went ahead and knocked out the 1950's linen closet that went all the way up to the ceiling too. That's it for the demo, in the bathroom anyways. I can do anything...when there's a will there's a way- it just takes a little longer than planned! 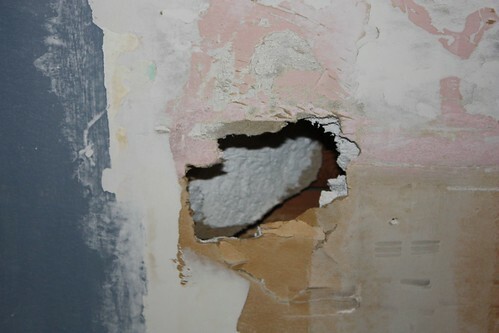 hole the hub made while crow barring out the vanity...oops. 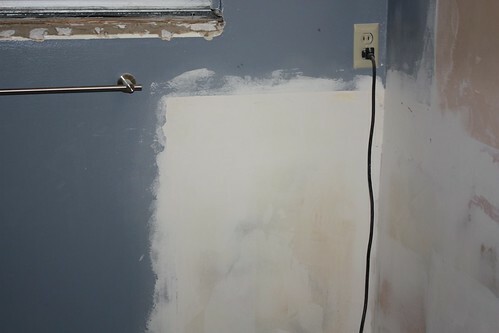 where the linen closet was...now new mudded drywall. Stay tuned... there's never a dull moment round here! i’ll be hitting you up when i’m lost after doing such to my bathroom! Ummmmmmmmmmmm… you rock! That’s all I can say. You are one brave, determined, motivated woman. I was impressed with a little tile rip out, I don’t even know what I am now. Can’t wait to see what you guys will do. You can do anything! This is so cool. And inspiring. Now I want to go home, find a sledgehammer and demo that green 50s tile out of our bathroom. Guess I should ask hubby first, right? Did you?